Hands On Out of thousands of smartphone vendors, TCL's BlackBerry Mobile unit represents one of a tiny handful targeting enterprise users. But its two QWERTY models to date have been priced at a premium, north of £500. Unveiled at IFA this week, budget model the KEY2 LE cuts costs in a bid to attract the corporate bulk buyers. The formula is straightforward. Take a midrange processor for endurance then beef this up with a hefty battery. While the KEY2 had a generous 6GB of RAM, the LE has a perfectly adequate 4GB. Savings have also been made by using a polycarbonate frame, a non-touch physical keyboard, a slower Snapdragon 636 (rather than 660) processor, and slightly cheaper camera sensors (13MP+5MP main). The dimpled, grippy rubber-like material on the back feels fine, just not as plush as the KEY2. And somewhat disappointingly the power pack has been downgraded to 3,000mAh. That promises better-than-average endurance, into a second day for most, but not the extraordinary durability of the KEY2's 3,500mAh, which makes it a must for long days of travel or shows like IFA. To the naked eye it's the same, very sharp 4.5-inch display. Oldies will find using a larger-than-default font is a must. I had a little go on the "Atomic", red-tinted LE, which is clearly trying to strive after the shock and awe of the red and white BlackBerry Passport as one of the most striking phones ever made. I'm not sure it altogether works, as the rear material has a blueish tint. Clearly TCL isn't competing on specs. A full-touch device similarly kitted out would be around, or even under, £200 in 2018. The LE starts at £379 for the 4GB/32GB version. But you're really buying it for the convenience keys and thoughtful suite of office tools and utilities. I can think of nothing as convenient as the "Productivity Bar" for checking incoming messages and appointments. And the paranoid will welcome a locked area for photos, files, apps and documents. The KEY2 LE promotes app cloning, which other vendors including LG are also keen on, so you can use dual accounts with an app. It currently supports IM clients: Instagram, Facebook Messenger, WhatsApp and WeChat. Despite the slower processor than the KEY2, the LE's camera launched rapidly and I didn't notice any digestion time from capture to reviewing the image. The imaging was the one disappointment of the KEY2 – it falls far short of what you'd expect the hardware to deliver. So I deduce that the superior imaging of the LE is the result of more recent tweaks to the Camera app, which the KEY2 has yet to receive. 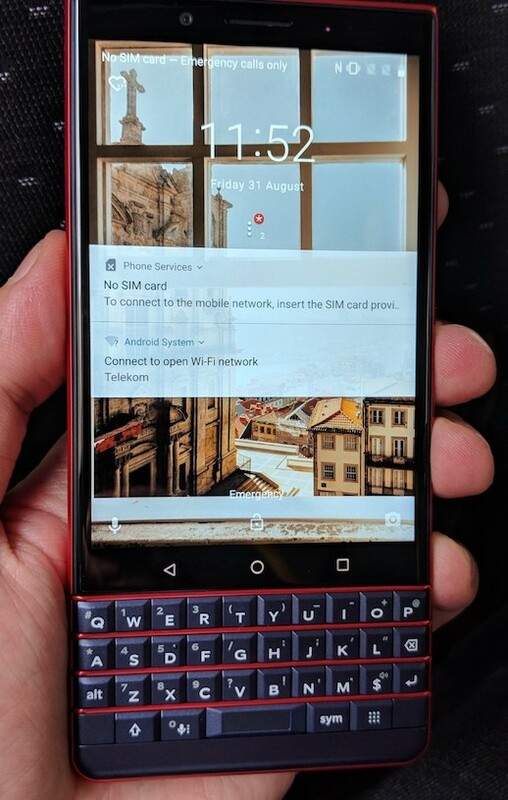 The KEY2 LE keyboard is only superficially similar to its swankier sibling – there's no gap from the edges of the keyboard to the edge of the phone, something familiar for the Bold series and other "classic" BlackBerrys. The distinctive contouring isn't as pronounced. But it may disappoint for two reasons. BlackBerry has removed the touch capability that allowed you to use the QWERTY keys as a keyboard for positioning the cursor, or flick typing, or scrolling through documents. Evidently that's now a premium feature. And coming off the KEY2, the keys felt stiffer and with less travel. The clicky feedback that makes the KEY2 such a breeze to type on isn't here. After three QWERTY devices, we can safely assume that TCL's BlackBerry Mobile isn't going to go broke in a suicidal attempt to make QWERTY popular again. It isn't going to give 'em away. However, even at £379 this doesn't offer a cheap path back to QWERTY – merely a slightly cheaper one.